What’s it like to work at McDonald’s? A McDonald’s employee prepares an order in 2011 in San Francisco. McDonald’s actually has pretty high standards for cleanliness and quality. I guess I can’t speak for every store, but the store I worked at was a stickler. It was all about washing your hands anytime you stepped away from your station, or at the least every 30 minutes. When I was working on the grill floor either assembling sandwiches or cooking meats, we were told that when in doubt, always just throw things away. Even if we were ridiculously busy, if the timers ran out on the meats, throw away that batch and make more. If the buns were past the expiration date, even if they were one day past due, we’d end up throwing away the whole batch. Once when I was assembling a sandwich, the wrapper slid off the table and I caught it in my hand at hip level, nowhere near the floor, but I was told to throw it away anyway. 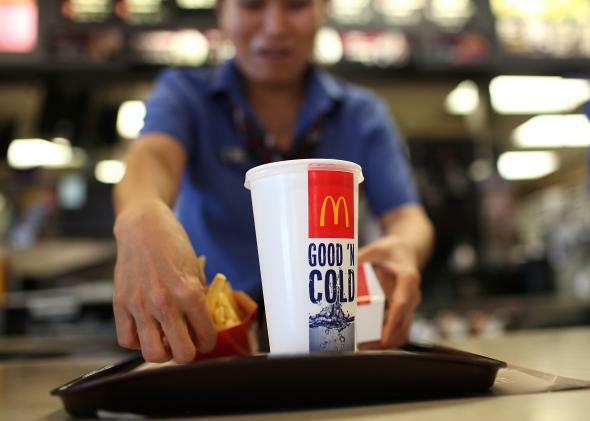 McDonald’s actually offers a variety of benefits that big corporations offer employees. They have health care benefits—granted I don’t know how good they were back in high school because I was still under my parent’s health plan. They did offer some tuition reimbursement if you were in school while working. McDonald’s pushed for fresh made-to-order sandwiches and changed the way a lot of fast food businesses were run. I worked at McDonald’s for 4.5 years, from sophomore year in high school to my sophomore summer home from college. If you look closely at the restaurant itself, you will see that at most McDonald’s today, there is an assembly line on the grill floor. At the rear is a screen with bun racks, which the “starter” toasts the buns and places the appropriate buns on the appropriate wrappers to start the sandwiches as much as possible before handing off to the “assembler.” The assembler then takes the sandwich and adds condiments and meat patties before wrapping and sending it to a heat tray. Each sandwich is made to order. It was not always like this. This change to making things fresh to order happened around the early 2000s. Back when I started work in the late 1990s, there was a big burger bin. Rows of specific burgers filled certain rows. Burgers were made in batches, microwaved, and stored in the bin. Numbers were placed behind each batch to signify how long ago it was made and for that batch to be thrown away after a given time. The person running the microwave was charged with calling back to the starter/assembler to make so many of each batch of burger to keep the burger bin stocked. This was very inefficient, as this required guessing at filling the bin without overstocking and throwing away food when it passed the allowed time before getting sold. These burger bins can still be seen in some older movies from the 1990s. McDonald’s is always changing and trying new things. I’ve witnessed many era’s of menu items being added and removed from the menu. I’ve gone through the Arch Deluxe, MBX, pita sandwiches, Mighty Wings phases, and the removal of the supersized combo option. When it started adding parfaits to the breakfast menu and salad shakers to the lunch menu, I dreaded working the opening shift. Those salad shakers were such a bad idea. For those who don’t remember, it was a salad inside a clear, tall, oversized sundae cup with a lid, filled to the brim with salad. You were meant to pour the dressing in, close the lid, and shake it up, supposedly better suited for eating on-the-go. Well, as bad designs go, the dressing just got smeared all over the lid and only penetrated the top layer of the salad. So naturally, after about six months to a year of that nonsense, they went back to regular salads on a plate. I do wish more McDonald’s restaurants would serve the McRib more regularly, with its weird-shaped pork patty, slathered in barbecue sauce, the sharp bite of slivered onions, mellowed out by the sweet tang from the two to three pickles meticulously placed, all melded together on a toasted roll (not bun). So this sandwich is actually only sold certain times of the year, pending pork prices, as well as by choice of the local McDonald’s store owner. So this has led to a bit of a cult-following for this seasonal burger, even with a McRib Locator website. McDonald’s caters to a lot of different tastes in different areas of the world, adapting to local cuisines and tongues. They have always been on the forefront of research and doing what it takes to start new trends and push fast food into new directions. It almost sounds like I work for them. But am I partial to their ways because I worked there so long? Maybe. I just always loved McDonald’s food and will continue to eat there, periodically and within reason. McDonalds: What are some favorite McDonald’s hacks? Fast Food: How often do fast food company executives eat at their respective restaurants? Starbucks: Why is it so cold in Starbucks?